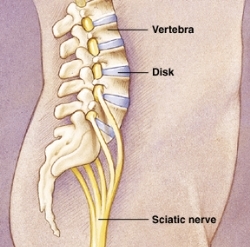 Sciatica is leg pain often due to pressure on a nerve in your low back that connects to the sciatic nerve. This pressure may be caused by pressure from a disc or a misalignment in the spine. You may feel pain, burning, tingling, or numbness that shoots down your leg. If you are experiencing these symptoms please give our team of professional chiropractors a call today.